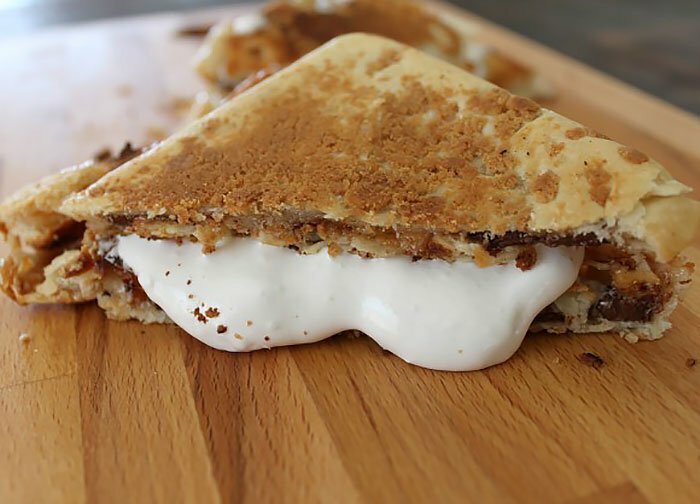 When most people think of sitting around a campfire, s’mores immediately come to mind. 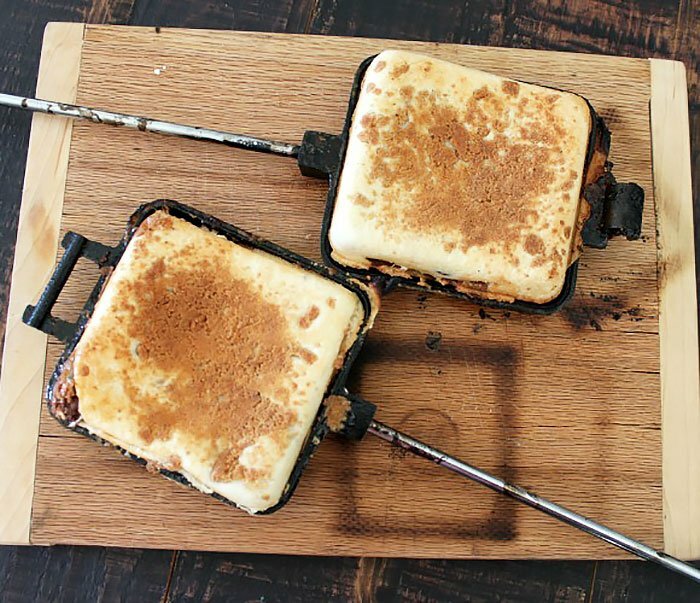 Add in pie irons to the mix and you take that campfire classic to a whole new level. 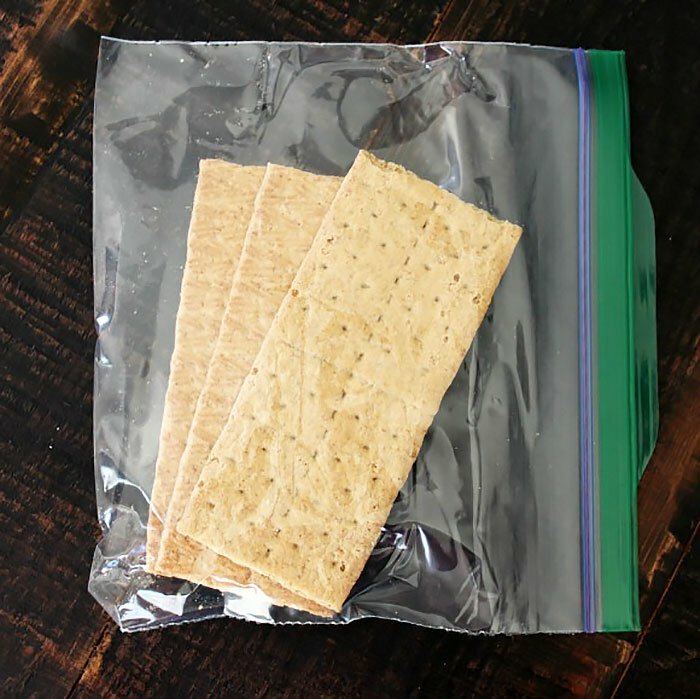 You can crush your graham crackers before you leave and put them in a resealable bag. Other than that, there’s not a lot that needs to be done before you head out to the campsite. Before you start putting together your s’mores, be sure you’ve let your fire burn down enough that you have a good bed of coals going. 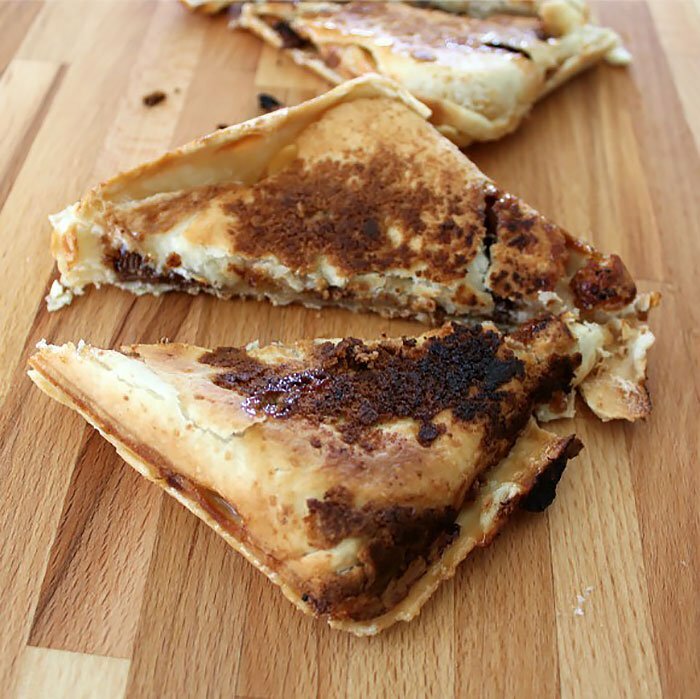 Putting your pie irons in a roaring fire is a good way to end up with burnt s’mores. Now that you have a good bed of coals, heat up your empty pie irons. Just put them over the coals for about two minutes, flipping once halfway through. 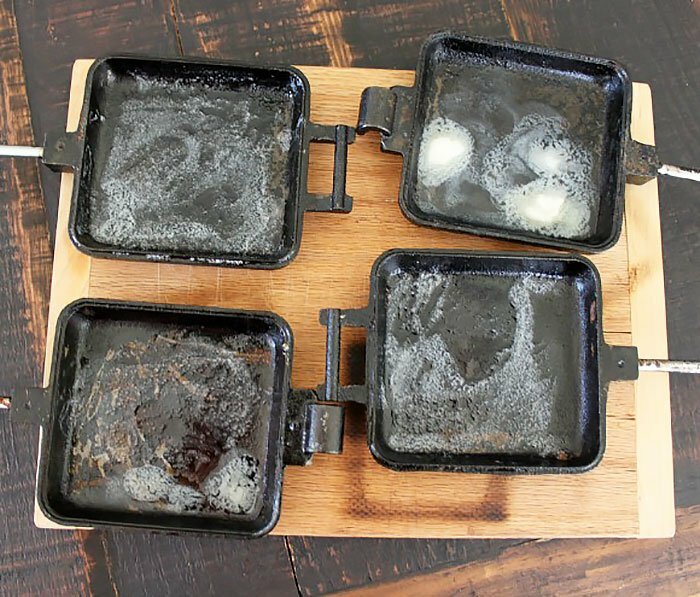 They don’t have to be branding iron hot, but they should be hot enough to melt the butter you’re about to put on them. 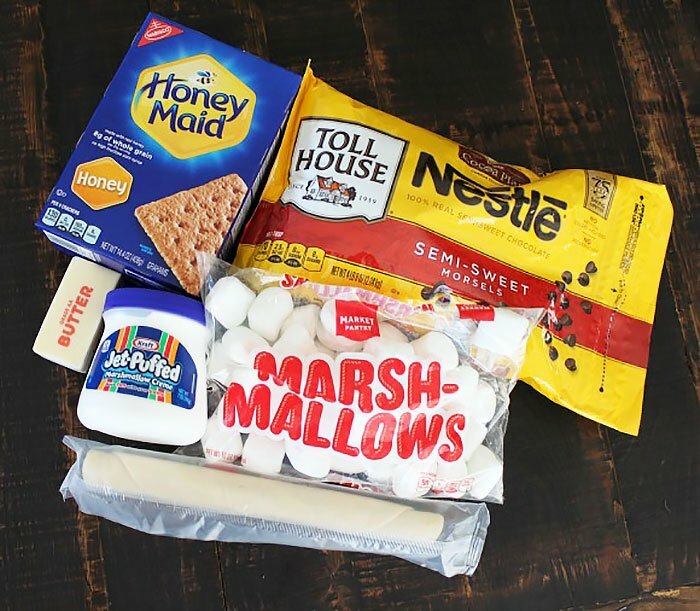 Now you’re ready to start assembling your s’mores. 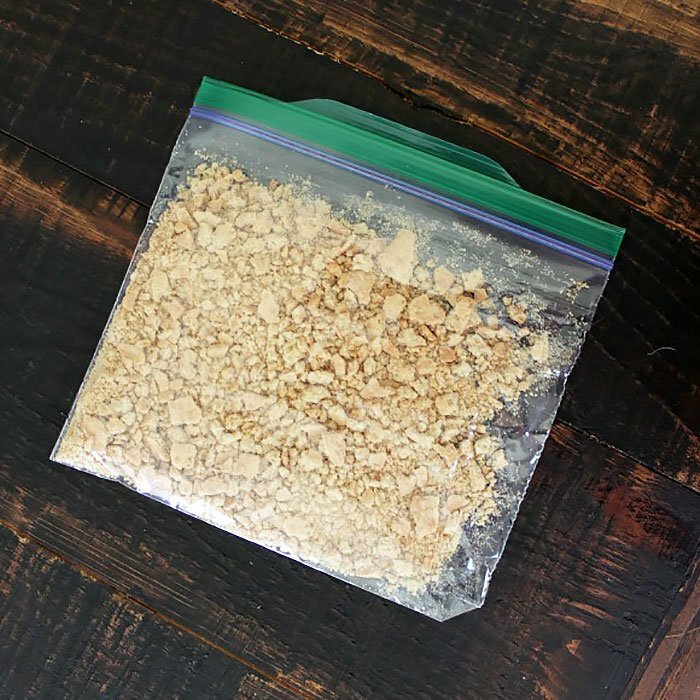 If you didn’t crush your graham crackers at home, go ahead and put them in your resealable bag and smash them with your fists until they are good and broken up. 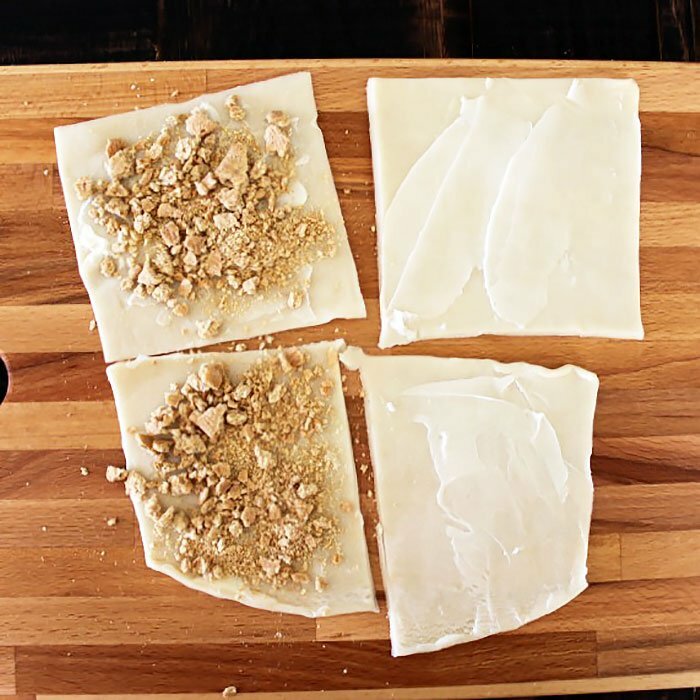 Next, lay your pie crusts out on your cutting board and cut them up into pieces about the same size as your pie iron, or slightly larger. 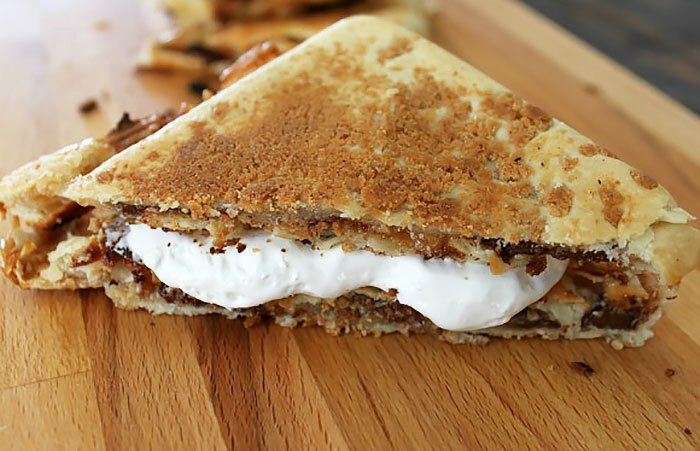 You’ll need eight pieces total to make the four s’mores this recipe calls for. 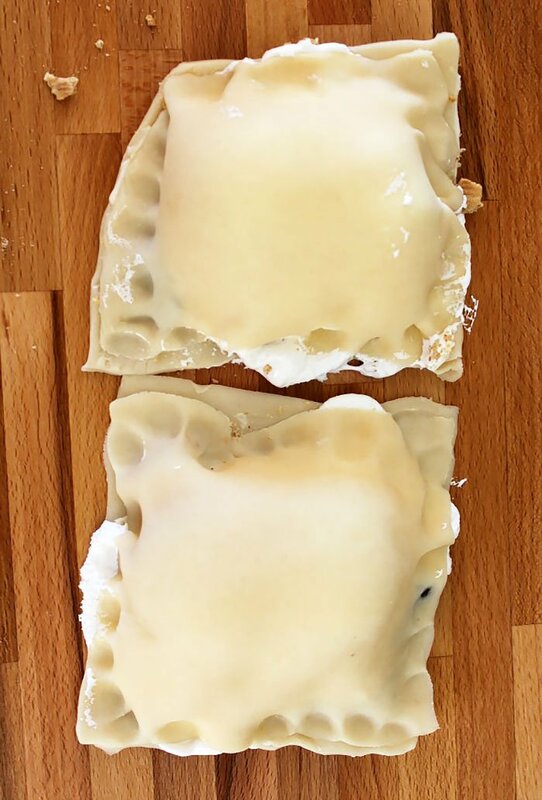 You should be able to get four pieces from each crust with the pre-made pie crusts from the store. 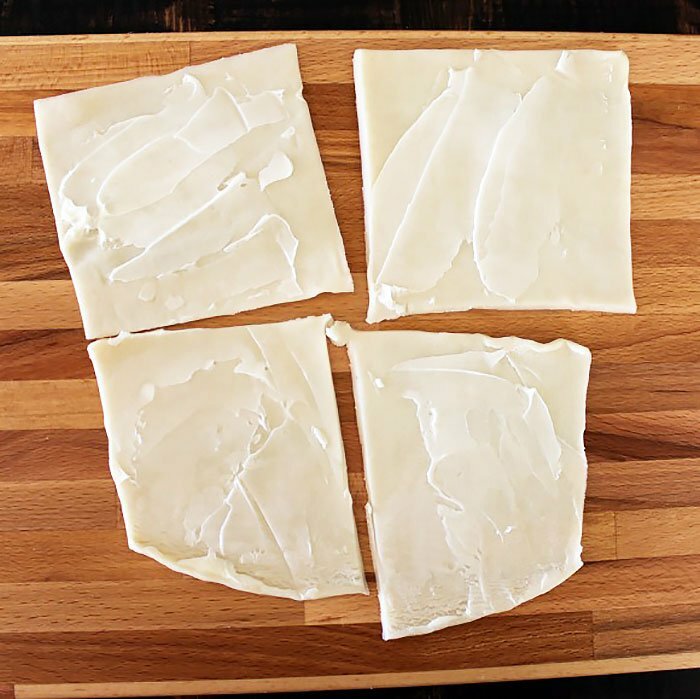 Now, butter all eight pie crusts. 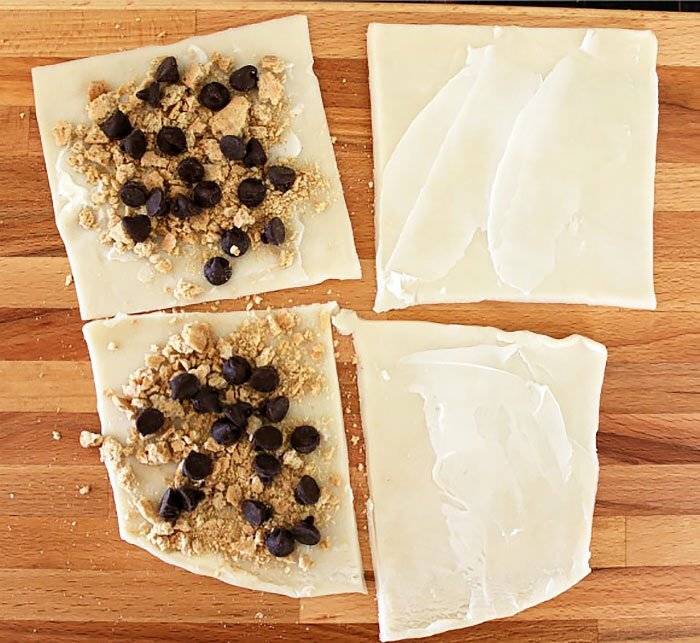 Next, sprinkle some graham cracker crumbs on one-half of the crusts. 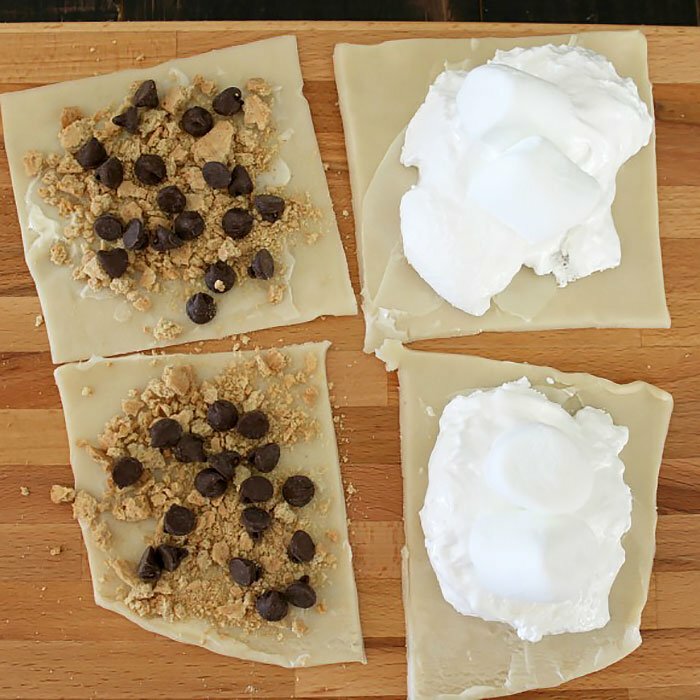 Top the graham cracker crumbs with chocolate chips. 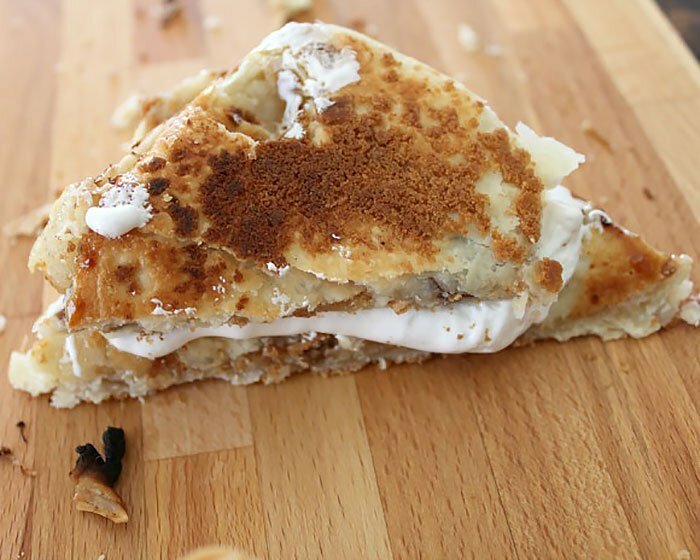 Now, on the opposite side from the graham cracker crumbs and chocolate chips, add some of the marshmallow creme. Lastly, add two of your jumbo marshmallows (hard to see in the picture due to blending with the marshmallow creme). It may seem like a lot of marshmallow, but it will shrink some when you’re cooking. Be generous with it. I don’t think there’s such a thing as too much marshmallow. 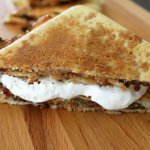 Now that you’ve got all of your ingredients added, carefully take the marshmallow side and put it on top of the graham cracker side. 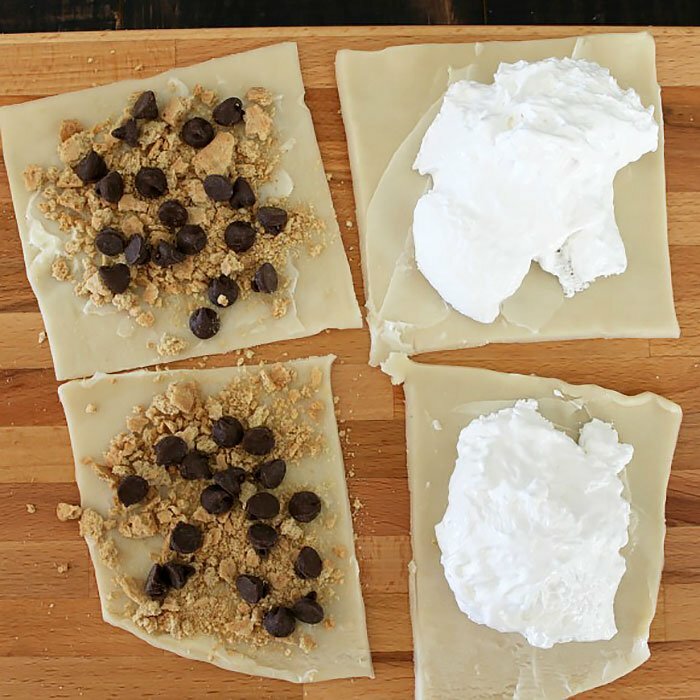 Once you’ve got them together, carefully pinch the sides down, all the way around your s’more. Remember, it doesn’t need to look perfect. The pie iron will shape them a bit once they’re squeezed in there. Now it’s time to get your pie irons ready. Carefully butter both sides of the pie irons. 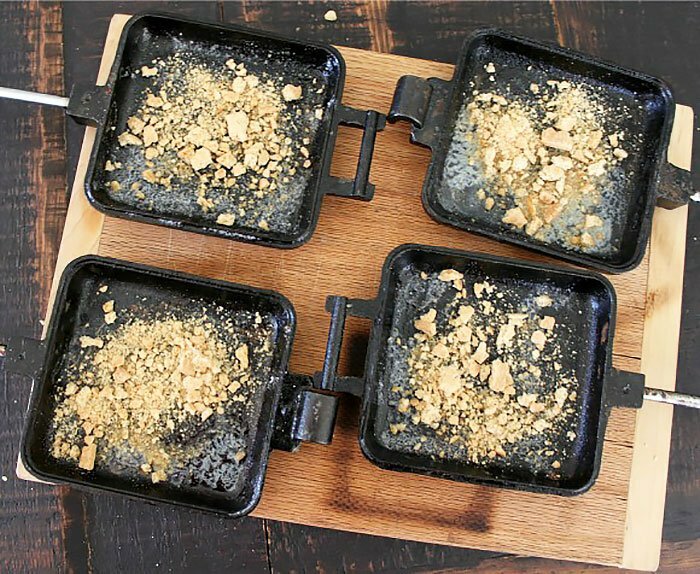 Sprinkle a bit more of the graham cracker in the butter on both side of the pie irons. 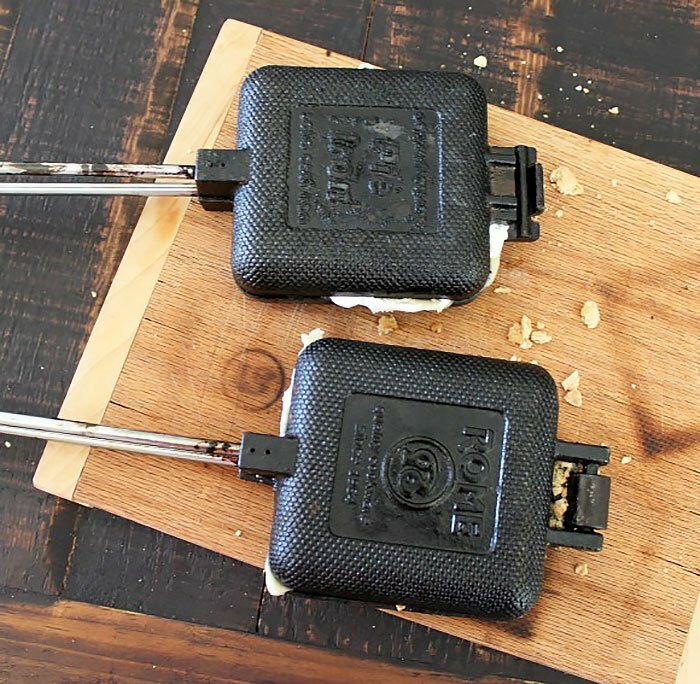 Now, gently place your s’more in one side of the pie iron and clip them together. If a little of your s’more pokes out the side, trim it off with a butter knife so that it doesn’t burn in the fire. You’re ready to put them in the fire now. Start by cooking them for about five minutes on one side, then turn them over and cook for another five to seven minutes on the other. 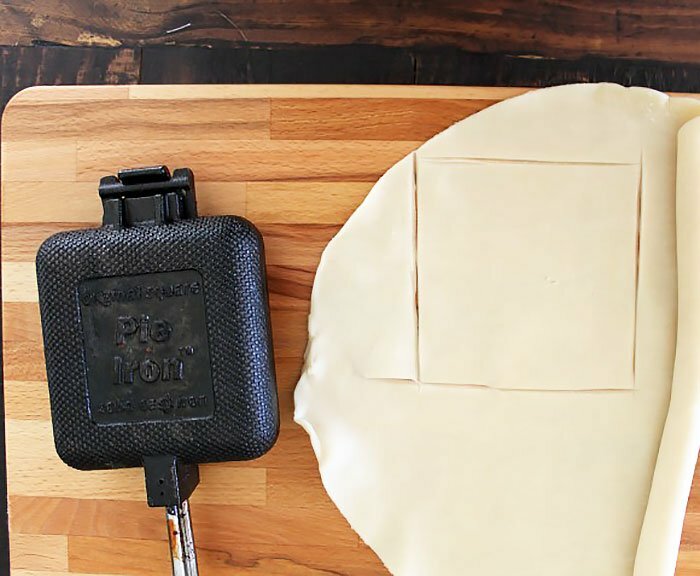 To check to see if they’re done, just pull them out, un-clip the pie iron and take a look. Once the crust is starting to turn golden brown, they should be done. As you can see in the picture below, the marshmallow disappeared somewhat like we talked about earlier. If you really want a bunch of marshmallow on yours, try cutting them in half, and adding more marshmallow creme in between and stacking the halves together. I can’t imagine somebody not liking this. Just bring plenty of napkins.